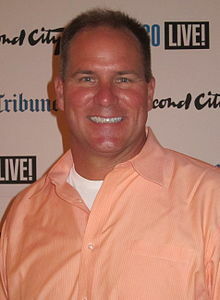 Lou Manfredini (born May 4, 1964) is an American television/radio personality and home improvement expert. Born in Highland Park, Illinois he is the host of HouseSmarts TV, Chicago's WGN (AM) Mr. Fix-It program, WABC-AM New York's HouseSmarts Radio, Los Angeles KABC (AM)'s HouseSmarts Radio and is a contributor on NBC's Today Show. Manfredini was born to Massimo and Lida Manfredini in Highland Park, IL. His father worked as an auto and truck mechanic, mother was a homemaker. Manfredini worked with his father on cars and trucks which ultimately led Manfredini to pursue a career in home improvement. While a student at Deerfield High School (Illinois), Manfredini worked at a hardware store and at a steel company as a welder. After graduating high school in 1982, Manfredini went to Millikin University in Decatur, Illinois on a musical theater scholarship. In 1987, Manfredini started a construction company in Chicago. After 8 years in business, he began a media career in 1995 when WGN (AM) Radio launched his idea for a home improvement call-in radio show. In 1995 after writing letters to pitch his idea for a call-in home improvement radio show on WGN Radio, morning show host Bob Collins booked Manfredini on his show as a guest where his nickname, Mr. Fix It, was coined. Soon after Manfredini joined host Roy Leonard on his Saturday show as a regular contributor which then led to his own Saturday morning call-in radio show which still airs today. In 2000, Manfredini became the home improvement contributor for NBC-TV’s Today Show, from 2006 to 2013 for NBC-5 Chicago and in September 2013 for WGN-TV Chicago. In 2006, he partnered with Frank DiGioia, President and CEO of Fort Productions, to create the news/magazine style home improvement and lifestyle show HouseSmarts. Manfredini is also the host of Lou Manfredini’s HouseSmarts Minutes (formerly Lou Manfredini’s Home Improvement Minutes) that are syndicated on radio stations across the United States. On May 29, 2015 Manfredini was inducted into the WGN Radio Walk of Fame. On January 14, 2017 Manfredini debuted the live show, HouseSmarts Radio, on 77-WABC New York. On October 14, 2017 Manfredini debuted the live show, HouseSmarts Radio, on 790-KABC Los Angeles. Manfredini has represented Marvin Windows and Doors nationally as their spokesperson since 2004 and serves/has served as spokesperson in the Chicago market for: Perma Seal Basement Systems, Chicagoland and Northwest Indiana Chevy Dealers and Baxter Credit Union (BCU). Since 2002 Manfredini has served as Ace Hardware’s resident “Home Expert” and editorial media spokesperson. Manfredini has been host of satellite media tours representing companies such as The Wood Promotion Network, 3M, Marvin Windows and Doors, Ace Hardware, Skil Power Tools. Manfredini has served as subject matter expert host for The Rug Doctor infomercial. Manfredini has sung the National Anthem at Wrigley Field, home of the Chicago Cubs, three times – once in 1998, once in 2001  and once as a duet in 2009 with his producer, Lindsey Smithwick (formerly Kreutzer). From 2002 to 2003 Manfredini served as the Home Category Expert for the Home Shopping Network (HSN). On August 18, 2011 Manfredini was a guest on the stage and radio show created by the Chicago Tribune and The Second City, Chicago Live! On May 30, 2012, Manfredini guest starred in the Irish musical The Twelve Tenors for one night at the Riverfront Theater in Chicago. Manfredini lives in Chicago with his wife and four children and runs the Edgebrook Ace Hardware and Villa Park Ace Hardware. ^ "Green Building Elements | From brick and mortar shops to city planning, we cover sustainable trends in construction, renovation, and more". greenbuildingelements.com. Retrieved 2015-12-02. ^ "HouseSmarts with Lou Manfredini". WABC-AM | Cumulus. Retrieved 2017-10-22. ^ "HouseSmarts Radio with Lou Manfredini". KABC-AM. Retrieved 2017-10-22. ^ "Lou Manfredini's 'HouseSmarts' Coming To WGN-TV/CLTV". Archived from the original on 2013-07-30. Retrieved 2015-12-02. ^ "WGN Radio Walk of Fame adds 10 'truly unique voices'". robertfeder.com. Retrieved 2015-12-02. ^ "Lou Manfredini Recommends Perma-Seal,Basement Waterproofing". permaseal.net. Retrieved 2015-12-02. ^ "5 Home Improvements in 15 Minutes". Archived from the original on 2011-03-10. Retrieved 2015-12-02. ^ "Pallet Enterprise Article - Wood Promotion Network Deserves Industry's Support". palletenterprise.com. Retrieved 2015-12-02. ^ "NewsInfusion". newsinfusion.com. Retrieved 2015-12-02. ^ "Home Windows and Doors Videos - Marvin Family of Brands". marvin.com. Retrieved 2015-12-02. ^ "Marla Pierson, Real Estate Agent - Northbrook, IL - Coldwell Banker Residential Brokerage". coldwellbankeronline.com. Retrieved 2015-12-02. ^ "Second Annual RugDocTour Blogger Event". Archived from the original on 2012-10-21. Retrieved 2015-12-02. ^ "Unlikely spot at Wrigley finds it's flush with politics - tribunedigital-chicagotribune". articles.chicagotribune.com. Retrieved 2015-12-02. ^ "WGN Radio - 720 AM | Chicago's Very Own – Talk, News Radio – Sports, Traffic, Weather, Blackhawks, Northwestern, Listen Live – wgnradio.com". wgnradio.com. Retrieved 2015-12-02. ^ "Summer 2011 guest lineups - Chicago Tribune". chicagotribune.com. Retrieved 2015-12-02. ^ "THE TWELVE TENORS Kicks Off Riverfront Theater's Inaugural Season, 5/30". chicago.broadwayworld.com. Retrieved 2015-12-02. This page was last edited on 26 November 2018, at 18:34 (UTC).